Is it safe to use hot tubs during pregnancy? No, especially in the first trimester. Lower the temperature, shorten the time and try other tips. A hot bath is a tempting experience even for pregnant women. After all, it feels like a great way to dissolve the muscle aches that come with pregnancy. But how safe is it to use a hot tub while pregnant? It is worth to note that a hot bath can cause a significant rise in body temperature; and if this is too high, it could affect the baby growing in the womb. For this reason, it makes sense to be cautious about that hot bath. Can You Use Hot Tubs While Pregnant? While some pregnant women believe that chemicals in hot water tubs are the reason why hot tubs may pose danger to their unborn babies, this is not the case. Provided the water in the hot tub has a balanced pH and isn't too hot, there is no reason why a pregnant woman should not enjoy it. The most serious danger of hot tub for a pregnant woman is excess heat. In most cases, the hot tub is factory set to 104° Fahrenheit, which is more than 5oF above human body temperature. Spending as little as 10 minutes can elevate body temperature by almost 4oF above normal body temperature of 98.6oF. This temperature level causes hyperthermia (excessive body temperature) which can endanger the pregnancy. Various studies show that hyperthermia (high heat) due to hot tubs or hot baths can lead to birth defects, especially during the development phase of the fetus. Neural tube defects (NTD), the most common problem, and miscarriage are more common during the first three months of pregnancy. For this reason, women are advised to avoid hot baths. While experts acknowledge that water temperatures of about 105oF are not likely to damage the woman’s cells, they can cause serious damage to the unborn baby. Hotter water during the first trimester may lead to fetal malformations or even miscarriage. Hot tub while pregnant can cause neural tube defects if the exposure to high temperatures happens when cells are forming into the neural tube. This is usually within the first trimester. Exposure to excessively hot water during the first trimester can also adversely affect the development of organ systems and facial features as these form during this time. For these reasons, pregnant women are discouraged from sitting or soaking in hot water, hot steam room or sauna during the first trimester. Provided you have a hot tub whose temperature settings you can control, you can try to take a bath in it. Talk to the doctor before changing your routine during pregnancy. This way, you will get a proper assessment of your risks and appropriate recommendation. Stick to your doctor’s recommendation. Adjust the hot tub to operate at a temperature below 100°F so that you have a bath as opposed to a hot tub while pregnant. This way, you can soak for more time without endangering your unborn baby. You should use a thermometer to ensure that the water in your hot tub is within a safe temperature range. As per the reasons above, it is within the first trimester that your baby faces the greatest danger of malformation or worse. You should therefore avoid the hot bath during this time, knowing that this will pass once you get into the second trimester. This way, you can regulate body temperature effectively. Use a pool noodle or kickboard so that your chest and abdomen are elevated while the legs and back receive the soothing feeling of the hot water. With half your body out of the water, it is less likely for you to overheat. It is recommended that you don’t stay in the hot tub longer than 15 minutes during pregnancy. To ensure that you don’t overstay, set a timer to go off at between 10 and 15 minutes. Hot tub water is normally hottest near the inlet. Therefore, pick a spot that is far from the inlet to avoid direct contact with the hottest water in the tub. In case sweating stops and you feel light-headed, or you feel uncomfortable in the tub, your body could be warning you that the body temperature is getting unsafely high. Heed the warning and step out of the water without delay. Additionally, have a bottle of cool water with you and keep sipping on it to keep your body hydrated. If you are not feeling well or your body temperature is higher than normal as a result of heat stroke, exercise or fever, stay out of the hot tub. Give your body time to regulate its temperature on its own first. 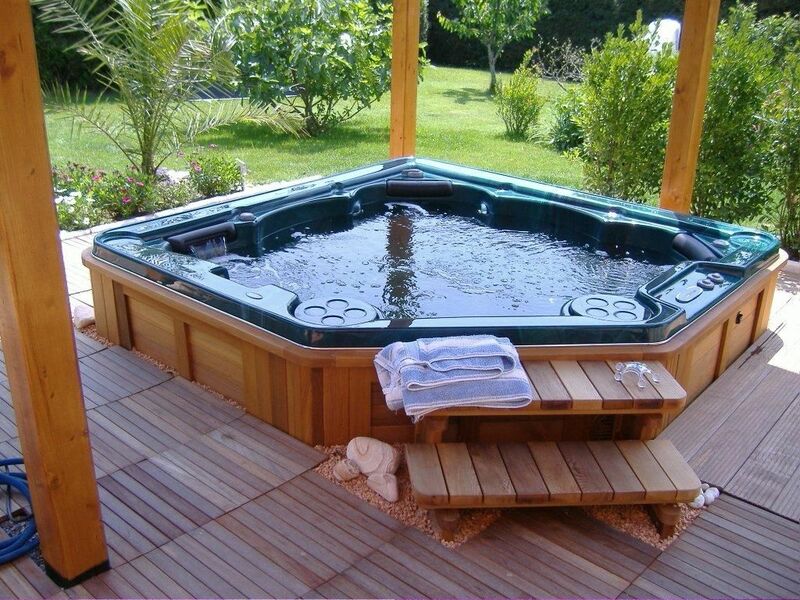 In case you feel more comfortable by not using the hot tub, so much the better. Take a warm bath instead. After all, it is less risky to your developing baby. In case you have more questions about use of hot tub while pregnant, talk to your doctor. For your developing baby’s sake, it is best to choose a warm bath. And by ensuring that your upper body stays out of the water, you are unlikely to get overheated. To make the bath more interesting, be creative by adding bubbles or even a scented candle. Then sit back and feel the tensions dissolving away.